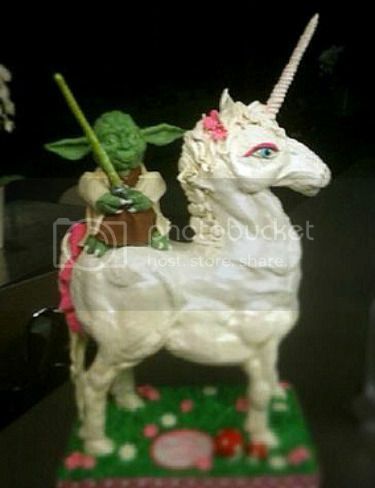 Director Zack Snyder (300, Watchmen, Sucker Punch) recently tweeted a picture of his daughter’s birthday cake from Violet’s Cakes, this cake depicting Yoda riding a unicorn. Because exactly. Via the Star Wars Blog, who just wanted a pretty Yoda cake, and somebody stuck a stupid unicorn on there. Snyder the Elder: Here’s your cake, honey. Snyder the Younger: Daddy, why the hell is there a unicorn on my Yoda cake? Snyder the Elder: Um, aren’t girls supposed… you know, to like unicorns? Snyder the Younger: *eye roll* DAAAAADY. That’s silly.